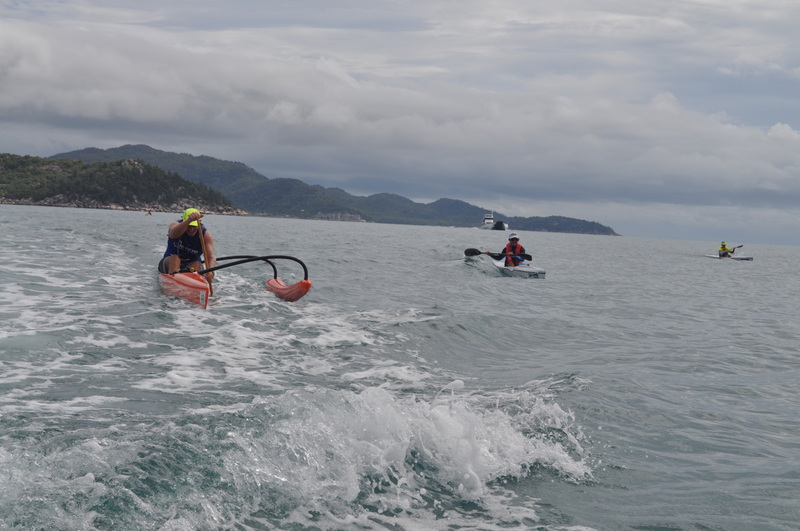 The North Queensland Ocean Paddle Series kicked off 2017 with the iconic Battle the Barge race. In hot, humid conditions and without a breath of wind, and grey clouds sitting low in the sky, paddlers began arriving to prepare for the first race of the season. Long course paddlers getting ready to race the barge were less than thrilled about the near flat conditions (therefore less bumps to ride), but were ready to take up the challenge. Paddlers headed out to the start line to await the Fantasea Barge Horn, indicating the start of the 2017 Battle the Barge. Would the hot windless conditions affect how many would beat the barge? Perhaps the lack of any kind of wind would be the mitigating factor. Either way, we were ready to see man take on machine again. The Women were sent off 2 minutes in front of the men’s field just ahead of the barge trying to set up for the first female win over the barge. The women’s sprint was close with Mel Goer from Magnetic Island half a ski ahead of Liz Kerr and Yvette Everingham another half ski back. The women set a cracking pace and quickly formed into breakaway groups to give the men targets to chase down for when they start. It wasn’t long before Liz Kerr put a 50 metre buffer on Mel Goer and Yvette Everingham who were glued to each other for bulk of the trip over. The barge travelled up the creek and sounded its horn sending off the men’s wave and the top sprinters were Alex Duggan, Ross Goodwin and Sean Brennan. Tyson Reeve was a while back in fourth place. The men’s lead group of 3 surged ahead and it looked to be a 3-man race against the barge until some barge boat wash swept across the course and was taken advantage of by Tyson Reeve bringing him into the lead group and all of a sudden the man became possessed and surged ahead putting a small gap on the previous race leaders. By this time the pointy end of the men’s field were the only ones to have caught any of the women’s field and the turnaround point was approaching fast. Looking over at the barge which had not made land on Magnetic Island yet we were sure the Man vs Machine was going to be a record breaker watching at least 10 paddlers turn the first buoy before the Barge had landed to drop off its payload to the island, it was then a matter of the return paddle and barge trip to secure Human victory over the Barge. We were very optimistic of a female win this year with Liz Kerr so close to the top men’s field. As the Barge set off on its return voyage to the Mainland we could see it closing in on the rear of the field rather fast, as if it were self-aware and on a mission to terminate human paddlers. Tick tock 3 paddlers down, tick tock 8 paddlers down oh no middle of the field is down and we can see that the Women’s leader Liz Kerr is holding pace with the barge for a bit but we can see the barge is moving fast… yes too fast our women’s leader had fallen victim to the machine also. Humanity should still be happy in that last year the Barges time was around 1hrs 22 mins and this year it was closer to 1:15, the return trip at full pace and a self-aware machine with its own pride on the line made for an interesting and certainly tough battle the barge. The Humans certainly put in an amazing effort with super-fast times reminiscent of the original Battle the Barge wins set by Mick deRooy a few years ago. The hot conditions certainly affected paddlers with several very thirsty paddlers at the finish line enjoying he cocoSAMU coconut water and Fresh Market Fruit on offer. It has been great to see the general standard of paddling increasing in the North Queensland region over the years and it’s something we are proud to have been a small part of. Short course Paddlers were very pleased to see the flat conditions, giving them much higher confidence for the first hit out of the season. The Short course included SUPS and Juniors. It was so good to see juniors getting out and paddling (and having an absolute blast). 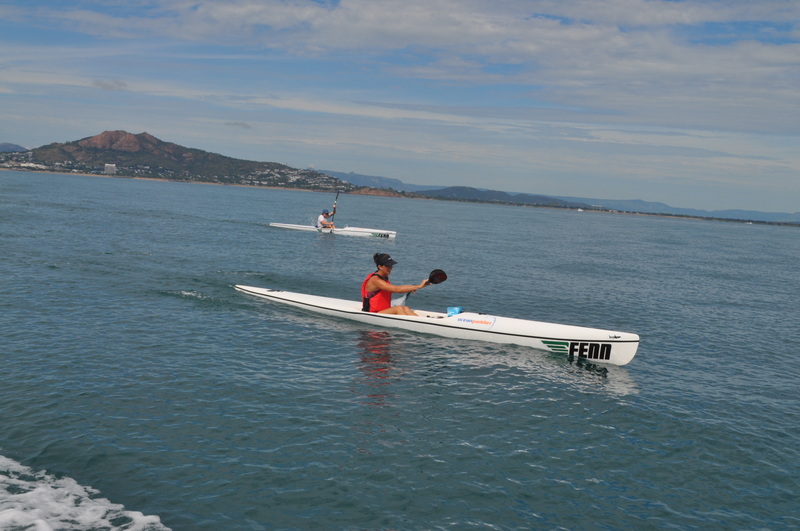 The Short Course competitors lined up at the start line and as we did the count-down they headed off on their paddle. The 6km (ISH) course a perfect way to get their paddling season started for the year. First short course paddler in was junior, Zanelle Fourie, who looked strong and confident and had a huge smile on her face. She was followed shortly after by SUP paddler Greg Tudehope. As the SUPS & Juniors began making their way in there were so many comments about how great it was to have a reason to be out on the water again. 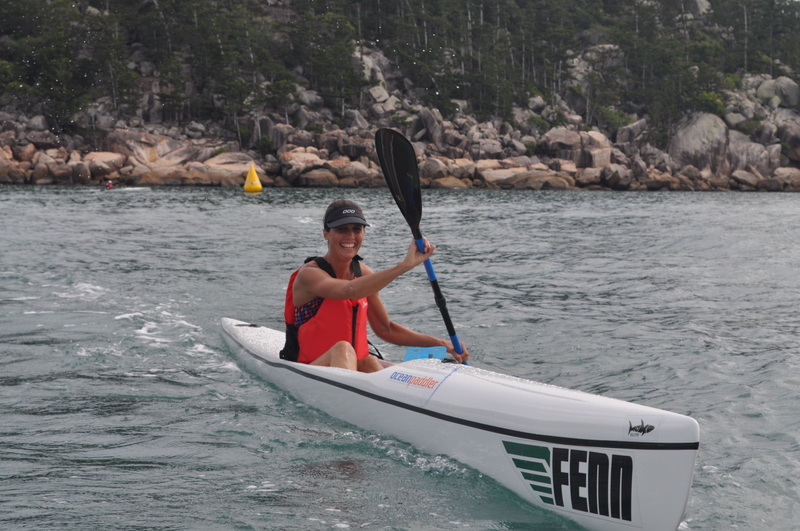 Lian Schmidt crossed first Female SUP paddler, Michael Fourie was first male Junior. 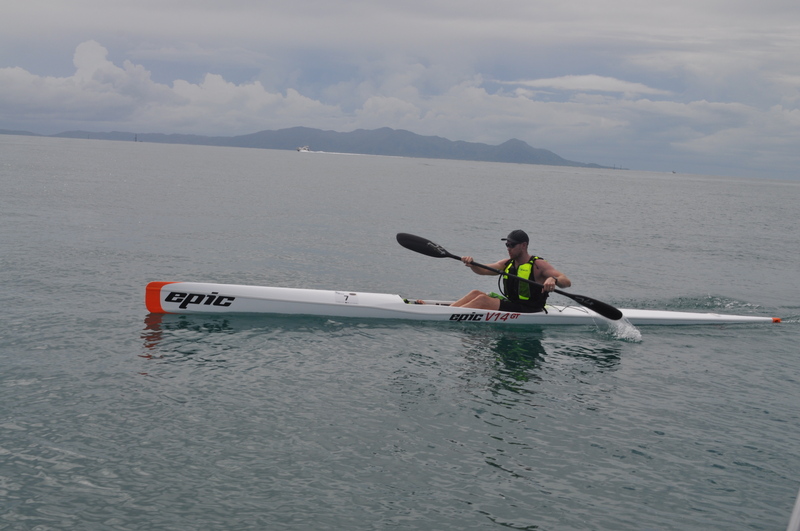 James Harris enjoyed the flatter conditions finishing first Short Course Male with some ferry cool modifications to his ski to make it more stable proving a great confidence booster with some close competition and Madeline Ward first short course Female. Many paddlers commented how their paddle was just the wakeup call they were needing, and we look forward to some awesome results in people’s paddling this year. The cobwebs were blown out for many paddlers, who felt they hadn’t fully prepared for today’s race. But at the end of the day, they loved their paddle and can’t wait to get back on the water next event. Our Short course is the perfect breeding ground to grow confidence and skills for paddling whilst able to stay close to shore and under our guidance. Our aim is to have people ready to progress from short course to long by the end of a season so this is the perfect place to get your friends to try their first paddle race, if you did a short course this weekend you can be happy to know the distance covered means you can make it through some of the smaller long courses on offer once you are comfortable in a bumpier piece of water.